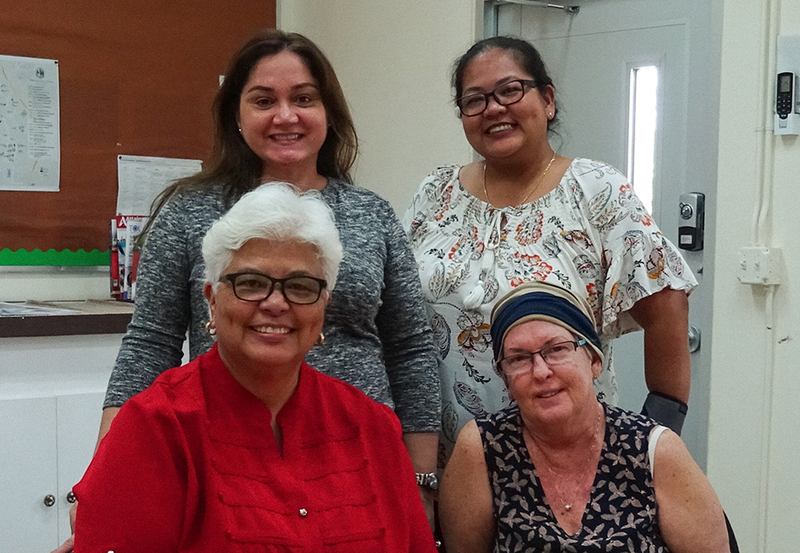 February 20, 2019: Terrie Fejarang, Guam CEDDERS Associate Director and EPICS Liaison met with Commonwealth of the Northern Marianas Public School System Special Education staff to discuss upcoming practicum options for the Saipan-based scholars. Front Row (L-R): Terrie Fejarang; Suzanne Lizama, CNMI PSS Special Education Director. Back Row (L-R): Nora Pangelinan, Data Management and Compliance Program Manager and Donna Flores, Data Management and Compliance Program Manager. 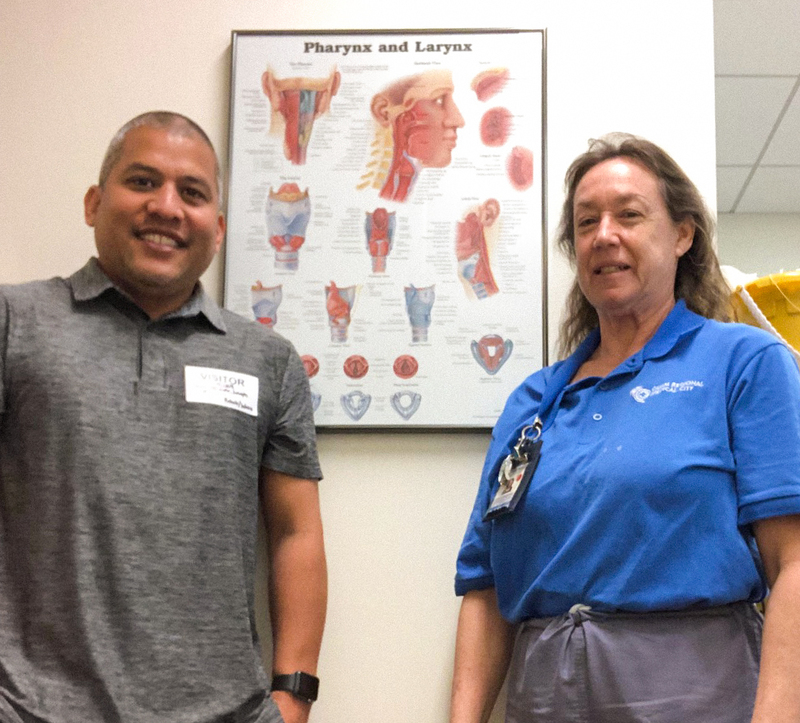 February 20, 2019: Terrie Fejarang, Guam CEDDERS Associate Director and Guam Early Hearing Detection and Intervention (Guam EHDI) Project Fitme Project Director, met with Angie Mister, CCC-AuD, CNMI EHDI Coordinator at the CNMI Public Health Center, Saipan, to discuss upcoming events within the EHDI Projects. February 20, 2019: Saipan-based EPICS scholars met with EPICS staff to discuss upcoming practicum activities. EPICS stands for “Educating Pacific Island Clinicians in Speech Pathology” a personnel preparation project funded through a U.S. Department of Education, Office of Special Education Program (OSEP) grant. 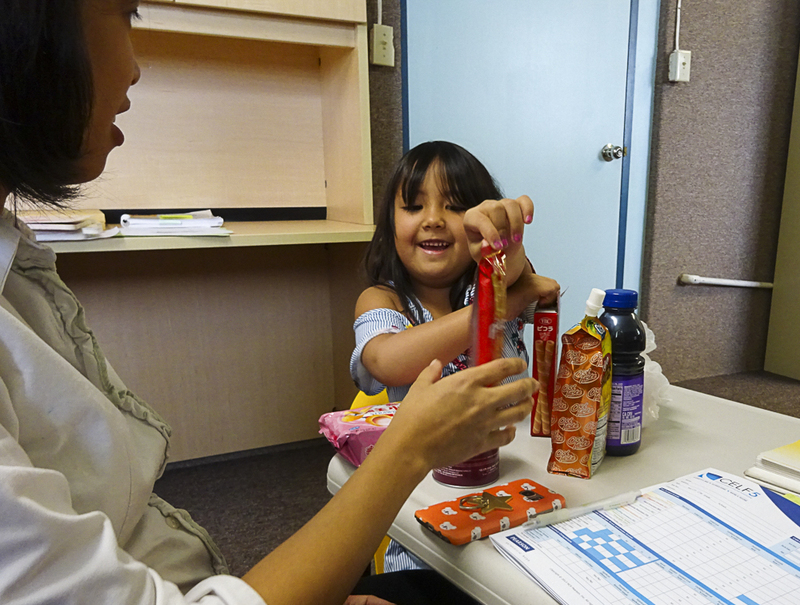 The grant supports the delivery of SJSU’s graduate program in Speech Language Pathology to Pacific scholars. 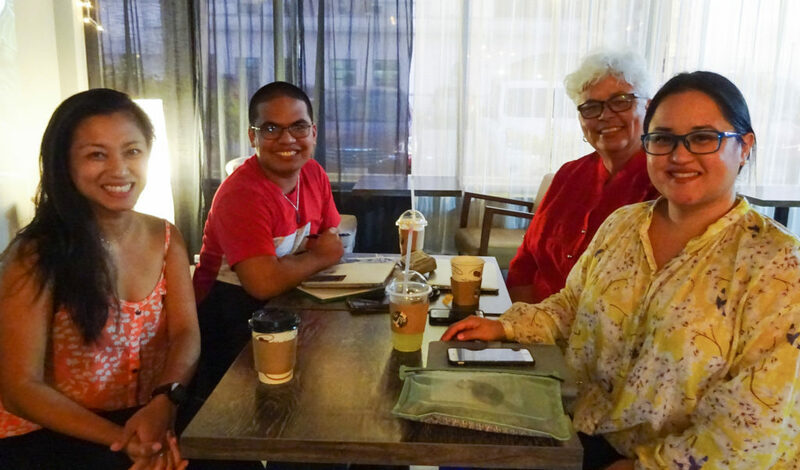 (L-R): Catherine Roszala, EPICS Scholar; Ignacio Dela Cruz, EPICS Scholar; Terrie Fejarang, Guam CEDDERS Associate Director and EPICS On-site Liaison; and Keokia Mendiola, CCC-SLP, EPICS/San Jose State University Clinical Practicum Supervisor. Not shown: Tricia Taitano, EPICS Scholar. 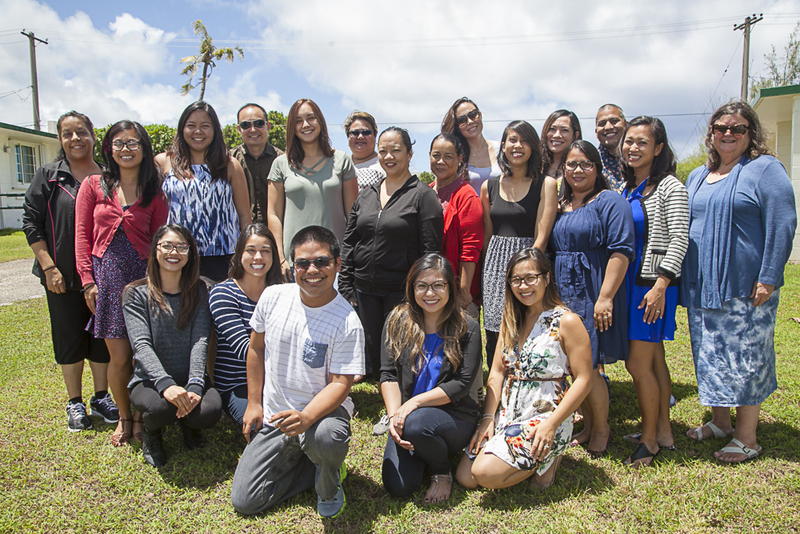 February 6, 2019: The Guam-based scholars in the Educating Pacific Island Clinicians in Speech Pathology (EPICS) San Jose State University graduate program in Speech Language Pathology will be starting their practicum in Guam Department of Education Schools by the third week of February. 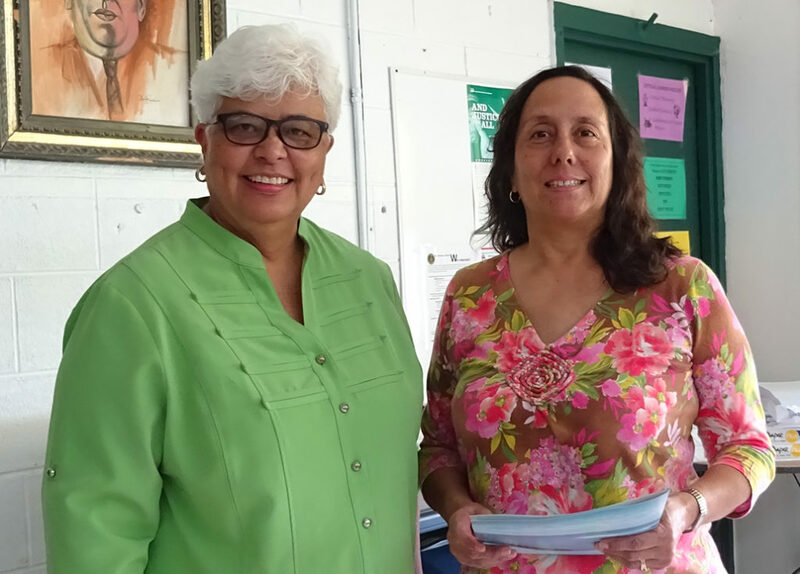 Natasha Dela Cruz, Principal at MU Lujan Elementary School in Yona, met with Terrie Fejarang, Guam CEDDERS Associate Director and EPICS on site Liaison, to discuss the latest project updates in preparation for the start of practicum. Ms. Dela Cruz is shown here signing consent forms to be sent to and signed by parents to give permission to the scholars to work with their child under the supervision of the licensed speech pathologist assigned to the school. 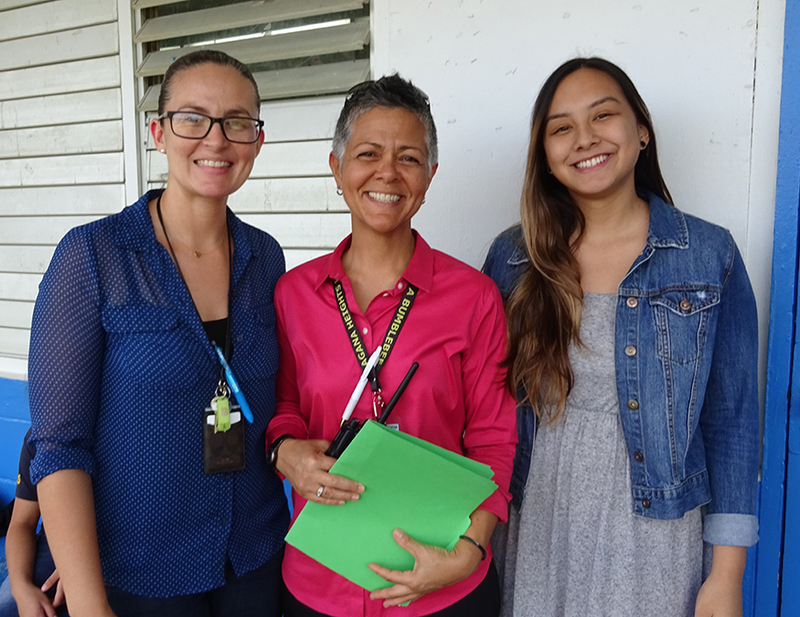 February 6, 2019: (L-R): Amalia Badua, Guam DOE Speech Therapist assigned to Agana Heights Elementary School (AHES); Hannah Gutierrez, Principal, AHES; and Meagan Terlaje, AHES Teacher and EPICS Scholar are excited about the anticipated start of student practicum by the end of the month. 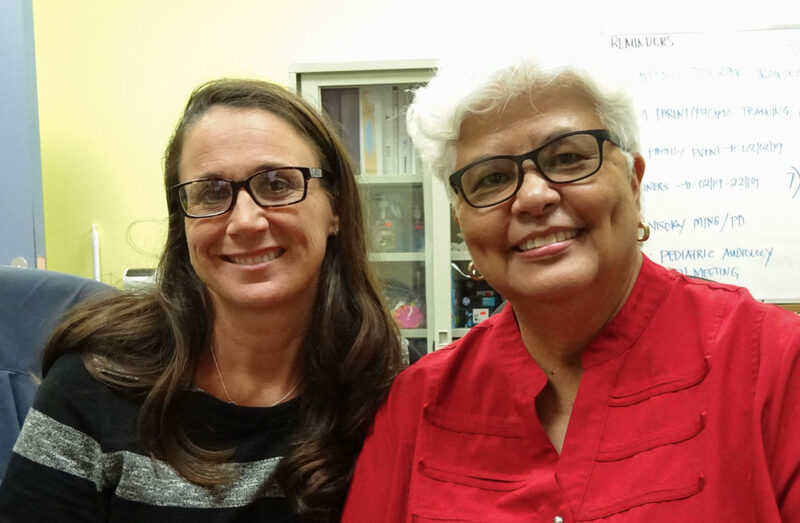 February 7, 2019: (L-R): Terrie Fejarang, Guam CEDDERS Associate Director and EPICS Project On-Site Liaison, met with Nancy Diaz, Principal, P.C. Lujan Elementary School, to facilitate the beginning of student practicum for the EPICS scholars. 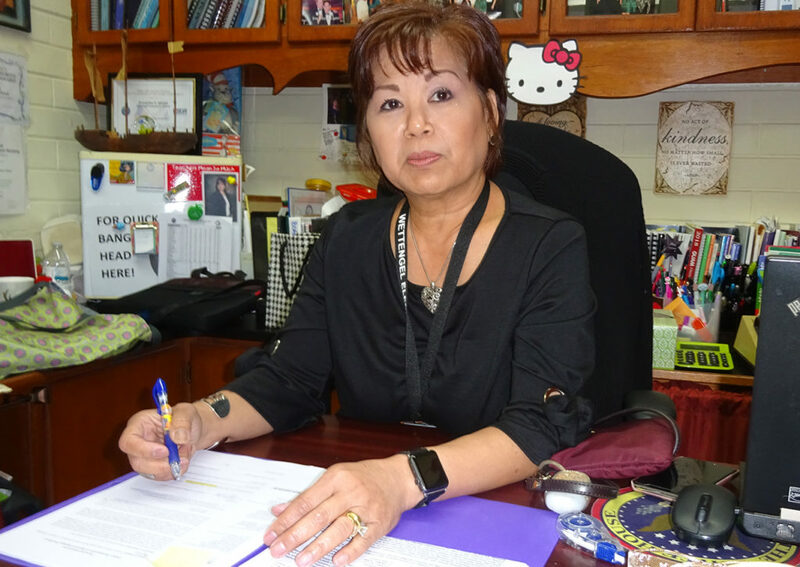 February 7, 2019: Evangeline Iglesias, Principal, Wettengel Elementary School, signs off on documents to facilitate the student practicum process for EPICS scholars. December 19, 2018: Camille Onglao Gonzales, EPICS Scholar, picked up a hard copy of “Cognitive Communication Disorders,” by Michael L. Kimbarow in preparation for the EDSP 265: “Cognitive Disorders” class which starts on January 7, 2019. Camille is accompanied by Mavi, her two-month old daughter. Both mother and child are clearly excited about the start of the new class. Happy New Year!!! December 13, 2018: Sibyl Crisostomo, CCC-SLP, (right) clinical supervisor at Guam Regional Medical City, explains bolus flow to Joseph Mendiola, during a bedside swallow assessment, as part of his practicum activities. Joseph is a graduate student under the “Educating Pacific Island Clinicians in Speech Pathology” (EPICS) Project, a collaborative project facilitated by San Jose State University and Guam CEDDERS. November 1, 2018: The Guam Regional Medical City (GRMC) welcomed sixteen scholars from the “Educating Pacific Island Clinicians in Speech Pathology” (EPICS) Project. The scholars visited the Rehabilitation Department to participate in “swallow therapy” classes. The visiting scholars are graduate students in the Speech Pathology Program at San Jose State University (SJSU) through the EPICS Project, a personnel preparation grant funded by the U.S. Department of Education’s Office of Special Education Programs (OSEP), in partnership with the University of Guam When the scholars graduate, the new Speech Language Pathologists will fill much-needed positions in Guam schools and hospitals. Participating in the classes were (Seated L-R): Cassandra Dimla; Aileen Serrano; Meagan Terlaje; Tatiana Perez; and Liahlanni Cruz. (Standing L-R): Sybil Crisostomo, CCC-SLP, GRMC Speech Therapist; Gabriella Duenas; Bobbie Obillo; John Payne; Lisa Eclavea; Jasmin Advani; Christina Coles; Dianne Sapida. 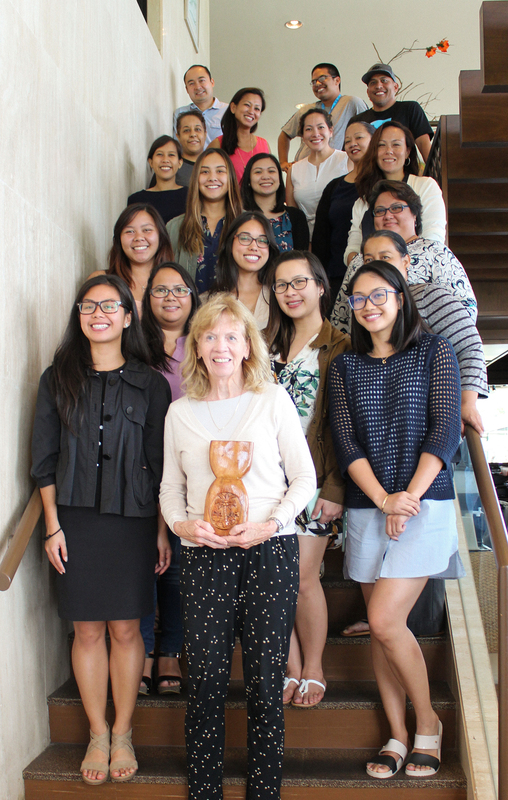 After spending an intense 10 days taking two on-site classes, the scholars in the Educating Pacific Island Clinicians in Speech Pathology (EPICS) Program had a small celebration on August 3 to commemorate the last day of class. 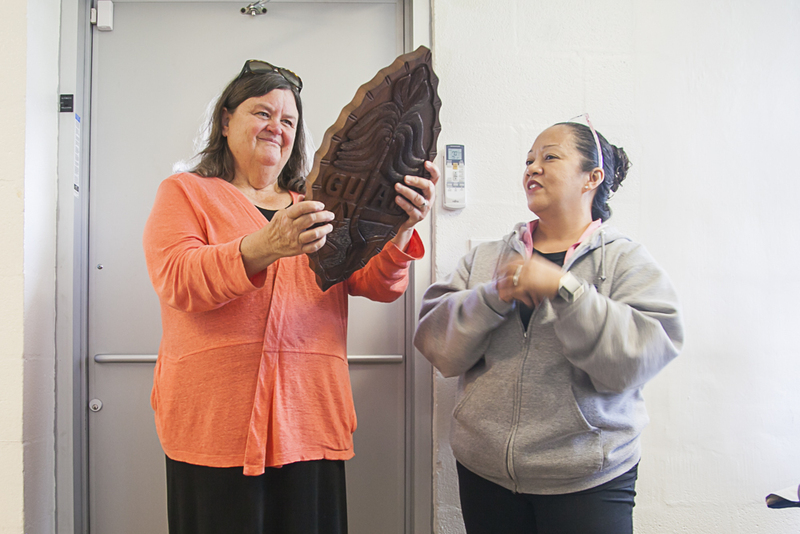 Dr. Carol Zepecki, (front, center) San Jose State University faculty, who taught the on-site classes on Assessment and Research Methods, is shown here with a carved latte stone as small token of appreciation from students. EPICS scholars are graduate students in the Speech Pathology Program at San Jose State University. (Front Row L-R) EPICS scholars pose with Keokia Mendiola, CCC-SLP, EPICS Clinical Practicum Supervisor, and Dr. Carol Zepecki, CCC-SLP, San Jose State University faculty, pose with the EPICS scholars during the end of the classes celebration on August 3. (Second Row L-R) Camille Onglao, Bobbie Obillo, Dianne Sapida, Tricia Taitano, Liahlanni Cruz, Megan Merfalen, Lisa Eclavea, Jasmin Advani. (Back Row L-R) Aileen Serrano, Catherine Ruszala, Lillian Reyes, Cassandra Dimla, Christina Cole, Gabriella Duenas, Ignacio Dela Cruz, Tatiana Perez, Meagan Terlaje, John Payne, JJ Mendiola. 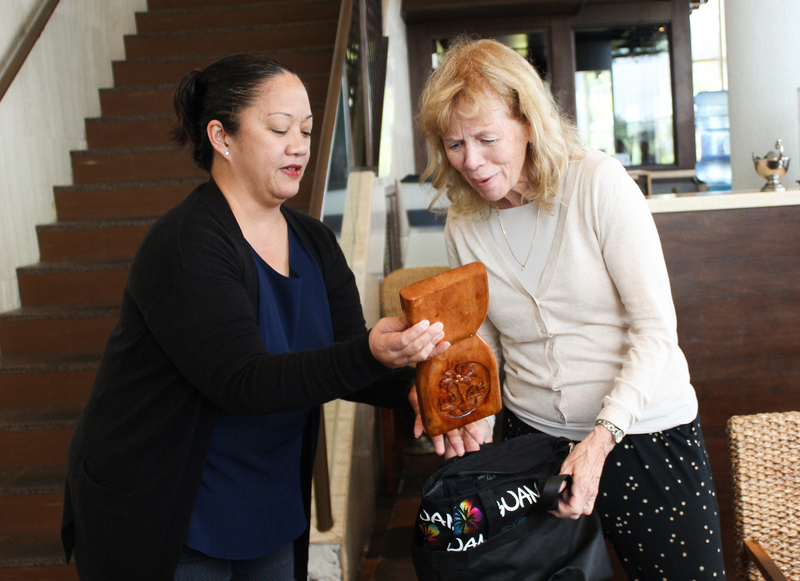 On August 3, Lillian Reyes, EPICS Scholar, presented a wooden carving of a latte stone to Dr. Carol Zepecki, as a small token of appreciation from the EPICS scholars. 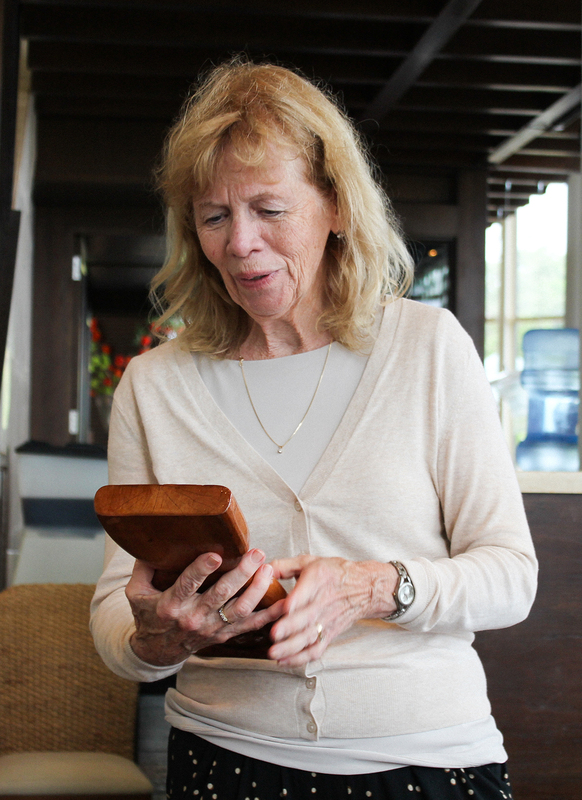 Dr. Carol Zepecki, expresses her thanks after receiving a carved wooden latte stone from students in the EPICS Project. On-site summer courses for the Educating Pacific Island Clinicians in Speech Pathology (EPICS) Project began on July 23 and will go until August 3. Dr. Carol Zepecki, CCC-SLP, faculty from San Jose State University, is the instructor for the two classes, EDSP 221- Research Methods and EDSP 276 – Clinical Practicum Assessments. 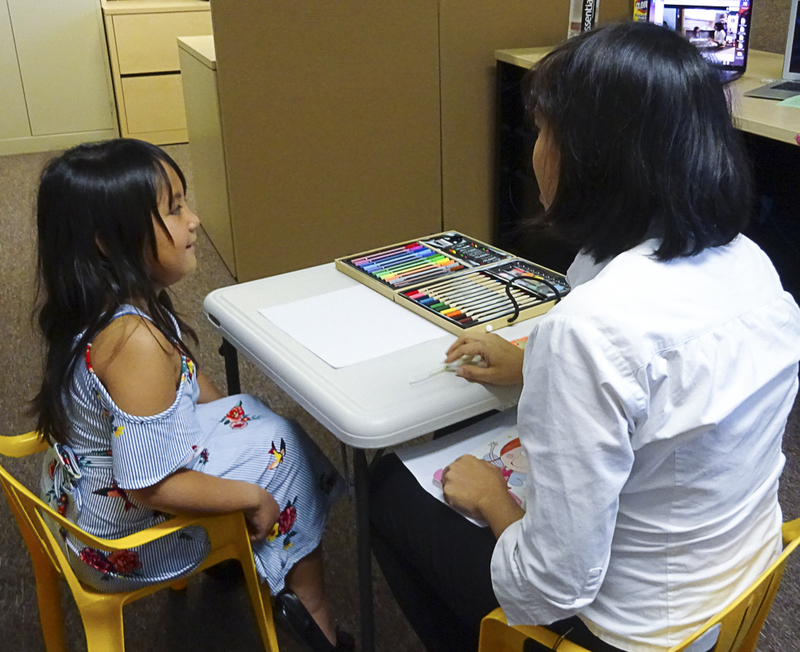 EPICS is a collaborative project between San Jose State University and Guam CEDDERS which brings SJSU’s graduate program in Speech Pathology to our region. There are currently 16 scholars from Guam and 3 scholars from the Commonwealth of the Northern Mariana Islands enrolled in the program. EPICS scholar Camille Gonzales takes the lead in facilitating this language assessment session on July 25. Scholar Lily Reyes (left) records data while Camille Gonzales (center) leads the session. Educating Pacific Islanders Clinicians in Speech Pathology (EPICS) Scholars participated in a “Site Visit Call” on March 16 conducted by the Council on Academic Accreditation (CAA) Team reviewing the San Jose State University graduate program in Speech Language Pathology. The CAA Team included (shown on the screen, L-R) Donald Fuller, chair of the Department of Communication Sciences and Disorders at the University of Texas Rio Grande Valley; Vicki Hammen, Ph.D., CCC-SLP, Associate Professor and Program Director of the Communication Disorders Programs at Indiana State University; and Kira Wright, MS, CCC-SLP, a speech-language pathologist and resource specialist for The Hello Foundation. EPICS scholars who attended the meeting were (clockwise, starting at right) John Payne, Megan Merfalen, Lillian Reyes, and Christina Coles. Not shown: Terrie Fejarang, Guam CEDDERS Associate Director, and EPICS Liaison for Guam and the CNMI. Scholars in the Educating Pacific Island Clinicians in Speech (EPICS) Project completed the final two courses to fulfill the undergraduate requirements for the San Jose State University graduate program in speech language pathology. 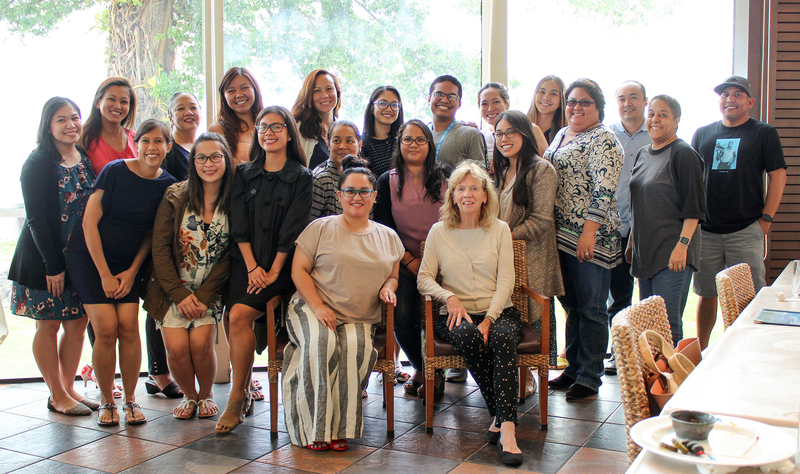 The courses, EDSP 112: Treatment and Management of Speech Language Disorders and EDSP124: Assessment & Evaluation, were taught on-site, the first face to face courses, by Jean Jackson, CCC-SLP, SJSU adjunct professor from June 5 – July 7, at house 24, Dean’s Circle, UOG. Shown above are: L-R: Front Row (kneeling): Gabriella Duenas, Meagan Merfalen, Ignacio Dela Cruz, Aileen Serrano, Bobbie Avelano. Second Row: Diane Supido, Cassandra Dimla, Megan Terlaje, Lillian Reyes, Tricia Tatiana, Camille Onglao, Liahlanni Cruz, Catherine Ruszala, and Jean Jackson, CCC-SLP, Professor. Third Row: Jasmin Advani, John Payne, Lisa Ecalvea, Christina Cole, Tatiana Perez, and JJ Mendiola. Lillian Reyes presents a plaque of the Seal of Guam as a token of the scholars’ appreciation to Professor Jean Jackson. 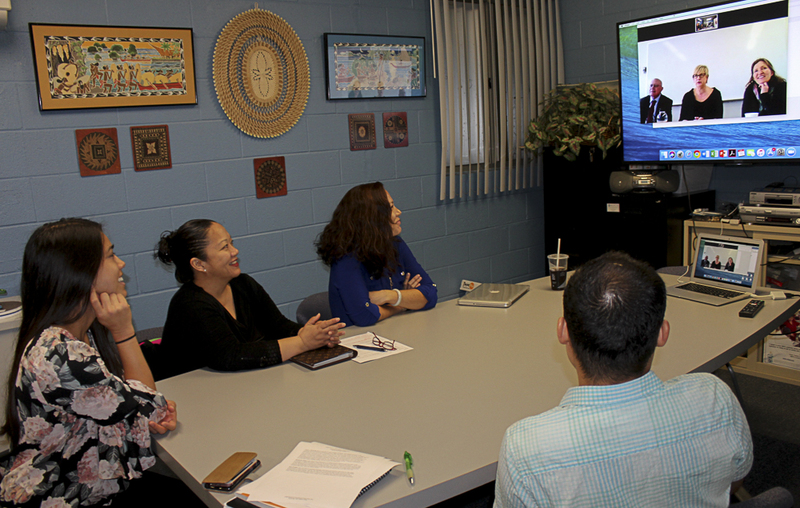 On February 20, Marianas Alliance of Speech/Hearing Professional (MASHP) met with Educating Pacific Island Clinicians in Speech Language Pathology (EPICS) Scholars to provide the opportunity to network and discuss the arrangements to earn clock observation hours.